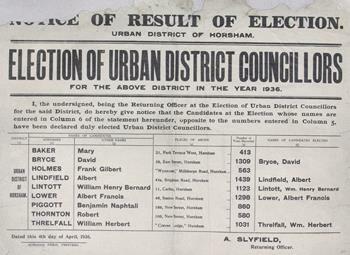 Result of election of Urban District Councillors for 1936. I, the undersigned, being the Returning Officer at the Election of Urban District Councillors for the said District, do hereby give notice that the Candidates at the Election whose names are entered in Column 6 of the statement hereunder opposite to the numbers entered in Column 5, have been declared duly elected Urban District Councillors. Candidate: M Baker, 21, Park Terrace West; D Bryce, 39 East Street; F G Holmes, Millthrope Road; A Lindfield, 44a Brighton road; W H B Lintott, 11 Carfax; A F Lower, 46 Sutton Road; B N Piggott, 186 New Street; R Thornton, 100 New Street; W H Threlfall, 'Crown Lodge'.